Remember when you were a small person, maybe around the ages of three or four, and adults looked absolutely massive? 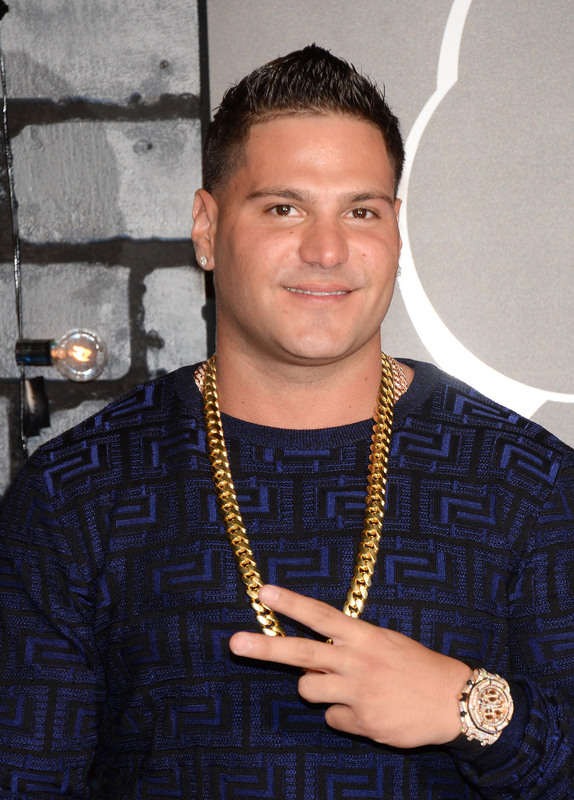 So, just imagine a gargantuan, bulky juice-head like Jersey Shore's Ronnie Magro cradling you at 18 months. Jenni "JWoww" Farley's one-month-old baby Meilani experienced this reality on Monday, when Uncle Ronnie held JWoww's baby while he paid his former costar a visit. If I were that baby, I would be terrified by the size of this person who is clearly not my mother. Ronnie posted the following picture to his Instagram on Tuesday, after meeting up with his old roommate to attend the premiere of Jersey Shore Massacre, a horror spoof of the show that JWoww produced. JWoww gave birth to Meilani about a month ago, and this appears to be Uncle Ron's first visit with the baby. In the pic, Ronnie is sporting his most show-stopping aviators, his loudest gingham, his most slicked back hair, and his sharpest vest. He hashtagged the photo "#family #lovethem #realmenwearpink #meilani." Now that the Jersey Shore stars are cradling children instead of handles of Smirnoff, the days of fist-pumping have officially reached Retro MTV Status. The child looks surprisingly nonplussed for having a large, strange man in such a boldly printed shirt invading her personal space, and I'm guessing her internal dialogue is going something like, "Please don't get any spray tan on my onesie. It's new." Do I have any hope of escaping my upbringing? Why does the this person who is neither Mom nor Dad have large, reflective eyes? Unless Ron Ron Juice is formula, I want nothing to do with it. My diaper must be changed. Can he help, or am I on my own here? Ah, the purity of infancy. A simpler time untainted by GTL, creeping, and shore houses.